When I was akid on Cousins Island, we had crab-apple trees in our yard. My childhood is marked by following those trees through the seasons, from the first bloom of the white flowers to the snow-like blanket the petals made when they fell to the ripening of the fruit to the ground littered with leaves. I’d always look for ripe apples to eat, the ones without too many wormholes. I liked climbing into the little nook of one of the branches and reading. Apples, apple trees, and apple picking are distinct joys of living in Maine. Cider from Sewall’s orchard graces our dinner table every night in the fall — and we stock up on frozen cider to last through the winter. Cider doughnuts are a Saturday morning staple. My mother-in-law’s apple pie is a coveted treat. For most of my life, though, I thought an apple was an apple was an apple. Until last year. We belong to Hatchet Cove CSA, a great farm-share in Warren. Every Tuesday from May through October, I pick up our shares at Pen Bay Medical Center, just down the road from the Down East offices. Then, come mid-September, our CSA partners with Out On A Limb, an heirloom-apple CSA based in Palermo (outonalimbapples.com). We get a bag each week with five or six different heirloom varieties, plus instructions on how best to utilize them. The CSA pickup night is an event, with my family tasting all the different apples and comparing notes. You can sample a few a varieties on October 14 at the Maine Organic Farmers and Gardners Association’s Great Maine Apple Day, which we’ve highlighted on page 33.  This whole issue gives you a taste of fall in Maine — my favorite time of year here — but to really sink your teeth in, I encourage you to explore its apples. There are Maine stories and farmers and traditions behind every delicious bite. From farms to footpaths and long drives to cold drinks, we have five favorite ways to love the fall in Maine’s scenic south. On her farm in Hollis, photographer Nina Fuller makes a near-daily practice out of capturing the serene, enigmatic animals that have (unexpectedly) taken over her life. Will our burgeoning awareness of tick-borne illness alter our relationship to the Maine landscape? 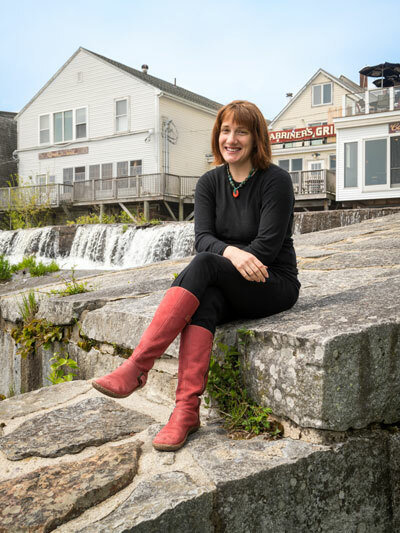 A wild Peaks Island art festival goes underground, playwright Bess Welden pens a script with help from refugees, Maine writer Elisabeth Wilkins Lombardo‘s posthumous novel is published, and the Maine Mariners take the ice for the first time. 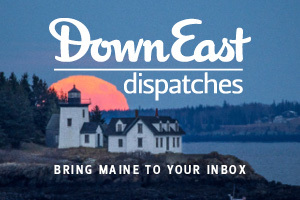 Plus, creative headlight alternatives and rowdy squirrels in Maine Dispatches. Biting into the refreshing resurgence of heirloom apples, small plates are a big hit at Izakaya Minato, and bowling alleys turn into dining destinations. Old-school agricultural tools from Perry’s Scythe Supply, plus Cumberland’s Vintage Bazaar craft fair and our contributors dishing on their favorite Maine shops and makers. A mod addition for a classic farmhouse in Owls Head, colonial reading lamps and primitive bowling balls in our own Antiques Roadshow, and a super-efficient DIY ski camp from Bungalow in a Box. 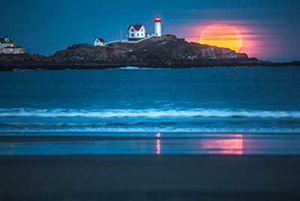 Editor’s note, reader feedback, responses to August’s Where in Maine, and more. The lobster baby bust, Room With a View. Pro triathlete Sarah Piampiano on Rangeley’s Cupsuptic Lake. On the cover: Along Hemlock Road in Acadia National Park, by Susan Garver.